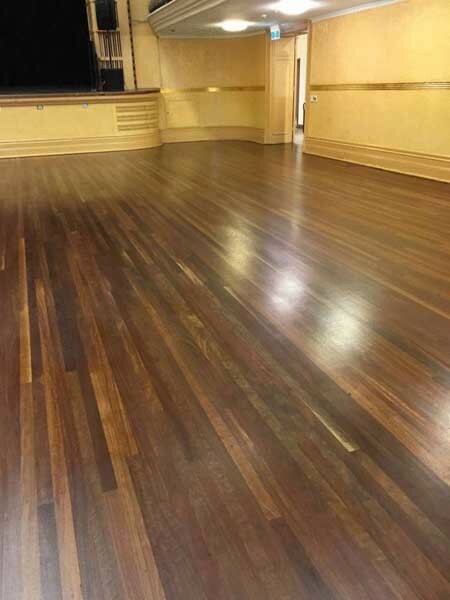 LIVOS Australia was contracted by the City of Yarra Council to sand and oil the beautiful old hardwood floor at the Fitzroy Town Hall. Built in 1873, the town hall is a heritage listed property and is often hired out for public functions. Not surprisingly, the stage floor in the Fitzroy Town Hall was in very poor condition as it was regularly damaged by those renting the hall. The Executive Project Engineer - City of Yarra explained that they began looking for a more environment-friendly method of treating their historic town hall floors in early 2011. The City of Yarra engaged Livos Australia to sand and oil the stage floor in the Fitzroy Town Hall. Livos’ solution not only has minimal impact from smell and disruption compared to traditional synthetic coatings, but also allows the floors to be repaired without the need to re-sand the surface. In the Fitzroy Town Hall project, Livos products were applied after the boards were sanded back, completely stripping the existing heavy varnish coating and exposing the beautiful old boards. The stage floor was fully revitalised using the Koimos no VOC oil. Following the treatment with Livos natural oils, the floor will no longer need re-sanding, allowing the surface to be repaired and rejuvenated without wearing out the historical boards. The stage floor at the Fitzroy Town Hall is being used as a case study to assess the effectiveness of Livos oils on heritage surfaces compared to synthetic coatings that would require re-sanding. This study is particularly important as a reference point when considering suitable coatings for old floor boards, given that multiple sanding can make the floor wear thin, damaging it permanently. Several heritage listed buildings are using Livos’ penetrating oils to extend the life of their old timber floors.